Spend your holiday on the sunny Costa Brava at the Yelloh! Village Mas Sant Josep. A mild climate, lush environment, huge aquatic park and full comfort accommodation: everything to make an unforgettable holiday in a camping on the Costa Brava. We offer services to make your holiday easier, from the time you arrive at the campsite on the Costa Brava to your departure. There is even a wellness area at the camping Mas Sant Josep with jacuzzi and sauna. Choose Spain for your holiday destination in one of the finest open-air hotels! Bathroom block renovated with spacious individual booths for adults and personalised fittings for children. A plant-filled oasis dedicated to wellness, in the middle of the swimming pool, with a Jacuzzi, massaging waterfalls, spa chairs, water jets and more. When you spend a holiday on the Costa Brava, you will instantly fall in love with the flamboyant, enchanting region. 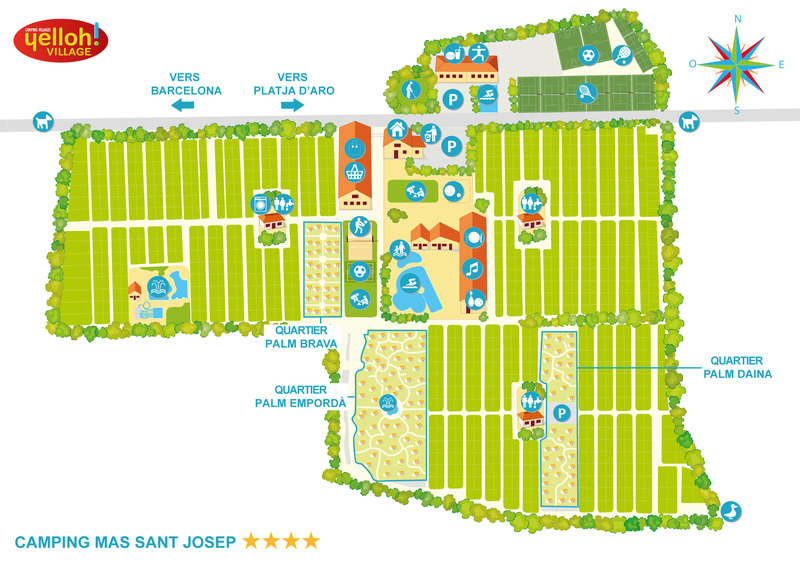 The Mas Sant Josep campsite is ideally located near the beautiful Mediterranean beaches! You can practice all of your favourite water activities and discover charming cities such as Cadaquès and Figueras. Nature-lovers will find unspoiled regions when they take a drive to the Catalonian hinterland or the foothills of the Pyrénées which are so close to our camping in Santa Cristina d'Aro. The Costa Brava is also a fabulous region for heritage buffs: don't hesitate to take an excursion to Barcelona, the Catalonian capital with exuberant architecture. Enjoy the Mediterranean lifestyle! You will love your camping holiday at the Yelloh! Village Mas Sant Josep!